Delectable Discovery: Sconeage’s Granola! | Delicious! Delicious! Caryn is preparing a breakfast tray when Lauren walks in, wheeling her carry-on luggage behind her. Well, I guess I’ll see you on set next week. Of course, it’s not too late to change your mind. Caryn puts on her best smile and opens a container of crisp, sweet oats and grains. She pours some into a little cup. Is this the granola he’s been raving about? Yeah, I got it at the farmer’s market last week. I just love it. Lauren picks up the container to read the label. He never liked granola before. Maybe I’ll try it. Sure, take that with you. I’ve got more. A loud, gong-like DOORBELL interrupts the conversation. Lauren shoves the granola in her bag and shuffles the luggage toward the back door. Bye. I know you’ll miss me. She watches out the window to make sure Lauren gets in the car. As the car drives away, Caryn gives in to the urge to do a little celebration dance. 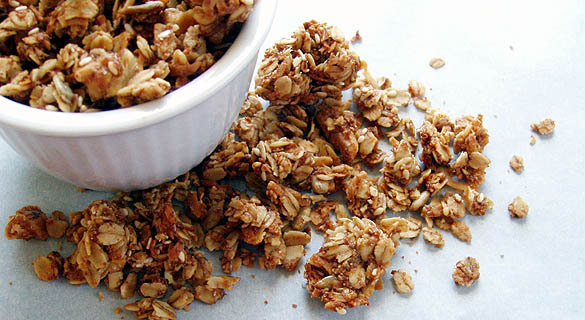 For someone who doesn’t usually care for granola, Sconeage’s granola is just fabulous. It’s really fresh and gloriously sweetened with brown sugar. Yum! Luckily, their products are all available online! Great writing, gorgeous shots, fantastic recipes…as ever! Thanks, Moira! Welcome back to the blogging world. I can’t wait for your new posts!